We were delighted to learn that students from National Citizen Service (NCS) in Aylesbury Vale were supporting Kids for Kids with their fundraising activities in July. It was all happening in conjunction with the Bucks Goat Centre, who adopted us as their charity earlier this year and told the students about us. We are so grateful to their inspired leader Ruth Gaisford for her inspired leadership. The students were formally awarded their certificates at a graduation and awards ceremony in front of their family and friends at the Aylesbury Waterside Theatre on 12th September. Ruth Gaisford from Bucks Goat Centre was presented with a giant cheque for £833.70 on behalf of Kids for Kids. The Bucks Goat Centre in Stoke Mandeville is very child focused, encouraging visits from many primary schools and over the Summer holidays they held a Charity Week with a colouring competition that raised funds for Kids for Kids. 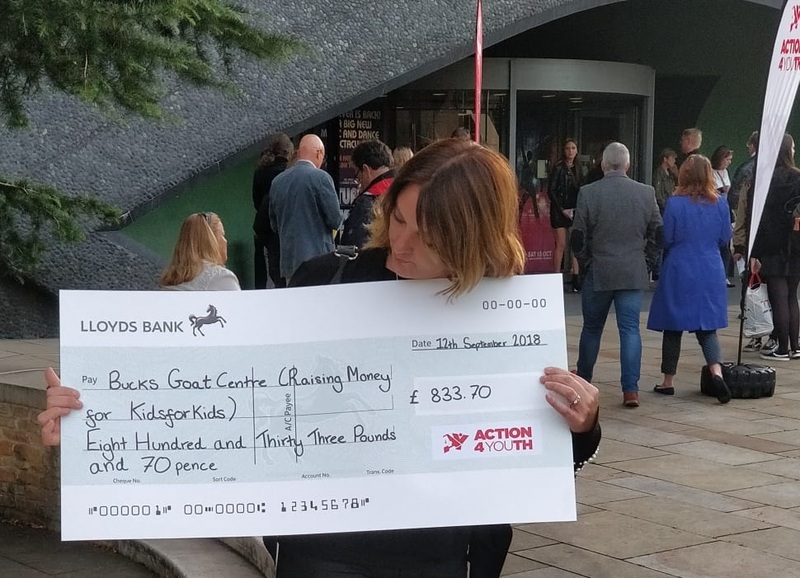 We are so grateful to all the students for their hard work in achieving this fantastic result and to Ruth for helping make this happen, as well for all the support she and the Bucks Goat Centre are giving Kids for Kids.